If you’re cooking Thanksgiving dinner, clean your oven tonight. I hope it’s self cleaning so it will happen while you sleep. If not, you still have time to get a new one so you don’t have to clean the old one. Let people bring stuff. Don’t be a martyr and do everything yourself. Your guests want to eat and drink with you, not see you slaving away in the kitchen, sweat dripping off the tip of your nose. Make a schedule, down to the minute! Include oven temperatures and how long things bake…when to turn on music…I’m not kidding. I don’t want to have to think or look up one thing. I want my biggest concern to be when to open the red wine so it has time to breathe. It’s going to be that kind of day. Make as much ahead of time as possible. You don’t want to fizzle before dinner is even served. Play music. It has to happen. We’re creating a vibe here. Start it early in the day and keep it going. Spotify will do fine. If you have more free time, make a playlist. Totally time well spent. Make a signature cocktail. Nary a holiday squeaks by in my house without a signature cocktail for the night. Think cranberries, pomegranate arils, vodka, simple syrup, rosemary. Try this here. Would someone create a change.org campaign so that everyone gets the days before and after Thanksgiving off? This holiday needs the proper respect it deserves. Make Ahead. Yay! 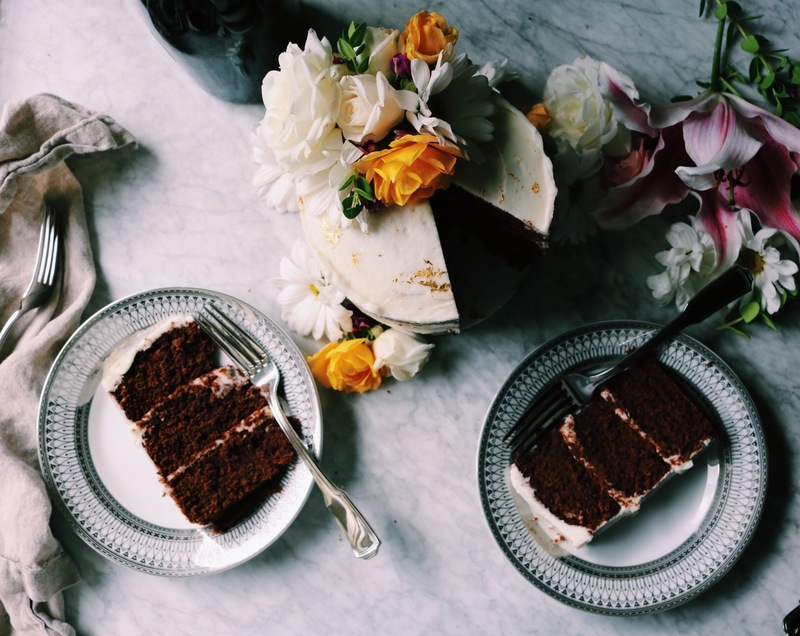 All Thanksgiving desserts should be make ahead. Make the chai pumpkin tart, let it cool completely in the pan, wrap tightly with plastic wrap and set it in a safe spot in the fridge. 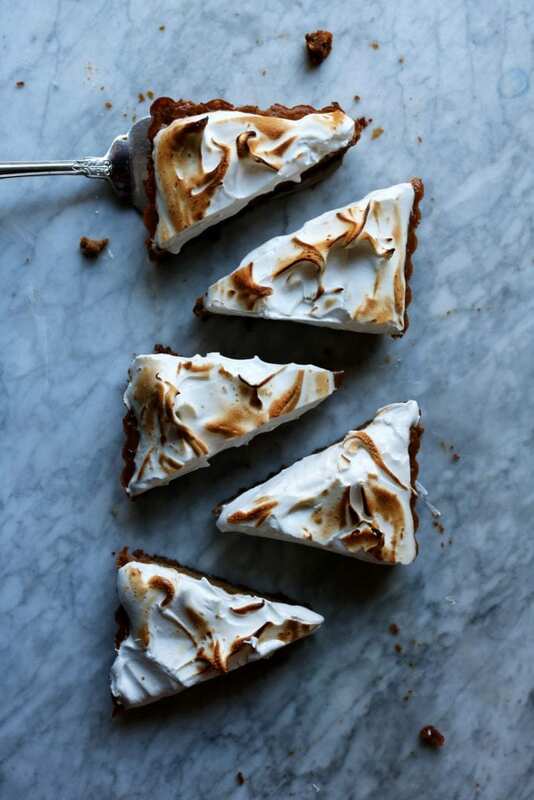 I would personally do the meringue topping the day of Thanksgiving. However, you could do it the day before and it would fair fine. 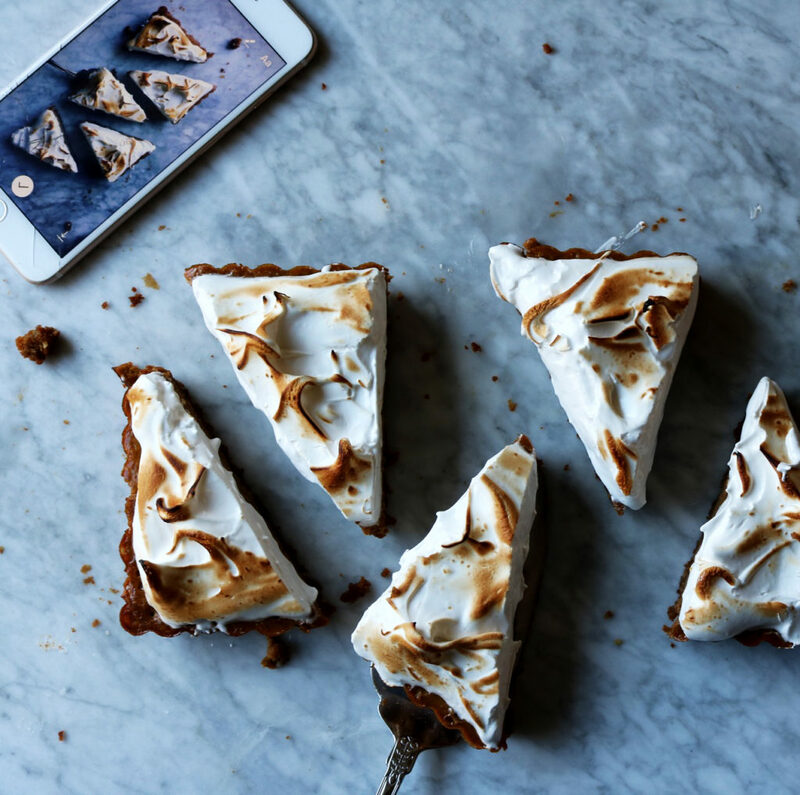 You could put tooth pics strategically throughout the chai pumpkin tart to hold up the plastic wrap so that it doesn’t squash your meringue. Just a thought. Pumpkin Puree. Libby’s is the absolutely best pumpkin puree. I’ve tried organic, I’ve tried Trader Joes…best flavor is Libby’s. End of story. And for the love of god, please don’t get pumpkin pie filling. Seriously. I’ll have to come rip it out of your hands. Meringue. Oh the joys of meringue. A couple tips… Make sure your whisk attachment + mixer bowl are freshly cleaned and dried. 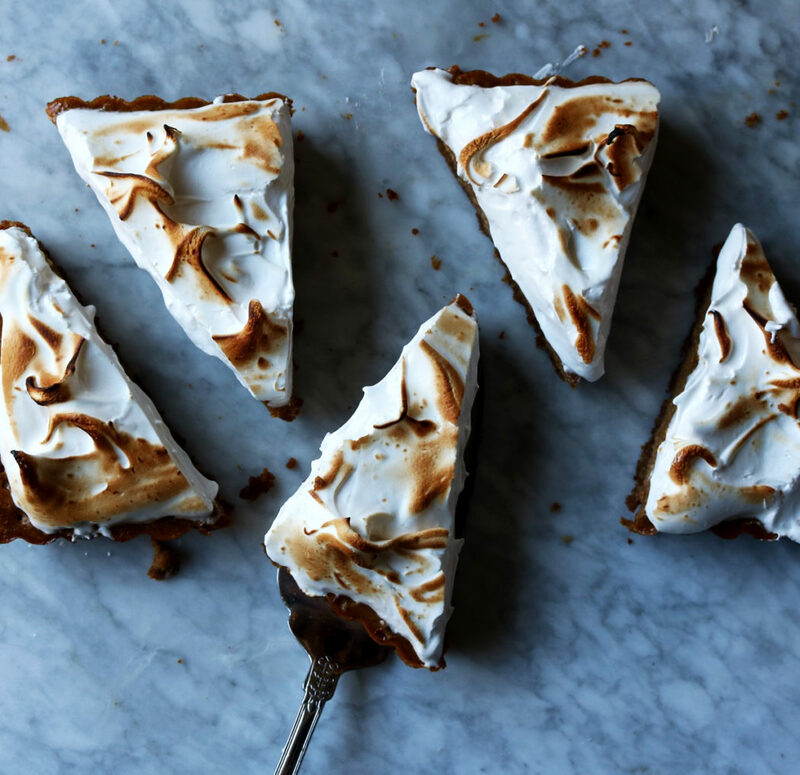 The meringue isn’t done until it holds peaks. 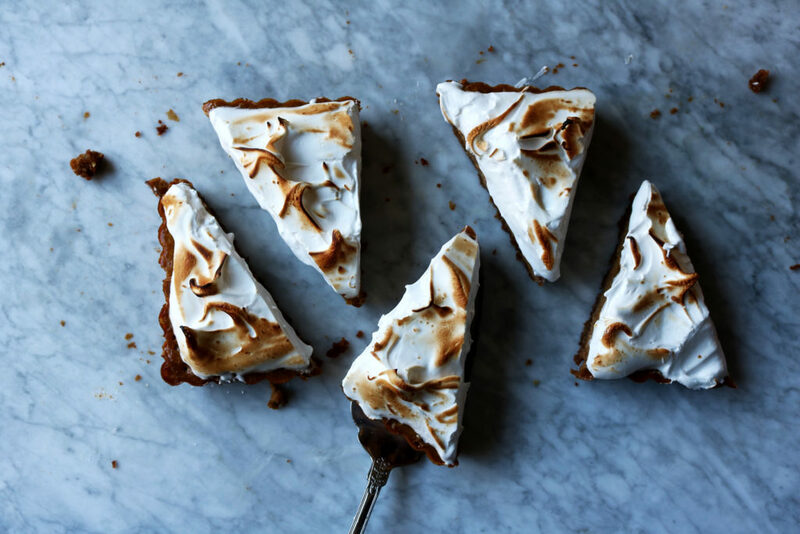 When it comes to torching your meringue, here are my thoughts… For the longest time I did the oven technique, under the broiler, and it works fine, but it doesn’t yield the prettiest bronzing. Spring for a kitchen torch. Not only will it look beautiful, but it is hella good fun. And we need more crap in our drawers. Tart Pan. This is the one I have (14X5 inches) and I love it! Get it! Let’s bake chai pumpkin tart, betches!!! Preheat your oven to 350 degrees F. Place a rack in the center of the oven. Butter a 14X5 inch tart pan and set on a baking sheet lined with parchment paper. Combine the cookies, pecans, brown sugar and ginger in a food processor. Pulse until they’re integrated into small crumbles. Drizzle the melted butter over the top and pulse until it’s the consistency of wet sand. Press the mixture evenly into the bottom of your tart pan. I don’t go up the sides because I want to see the layers of the pumpkin. Set on the parchment-lined baking sheet. Bake on the center rack in the oven for 12 minutes and set aside to cool. In a electric stand mixer fitted with the whisk attachment add the pumpkin, brown sugar and eggs and mix on low until completely blended. Add the cream, tangerine juice, vanilla extract, cinnamon, sea salt, all spice, cardamom, ginger and cloves. Make sure you scrape the sides and bottom of the bowl so that everything is incorporated. *Make sure you thoroughly clean and dry your whisk + mixer bowl so they are ready to make meringue two steps down. Pour the pumpkin mixture into the cooled gingersnap crust and careful transfer the baking sheet to the center rack of the oven and bake for 30 minutes. 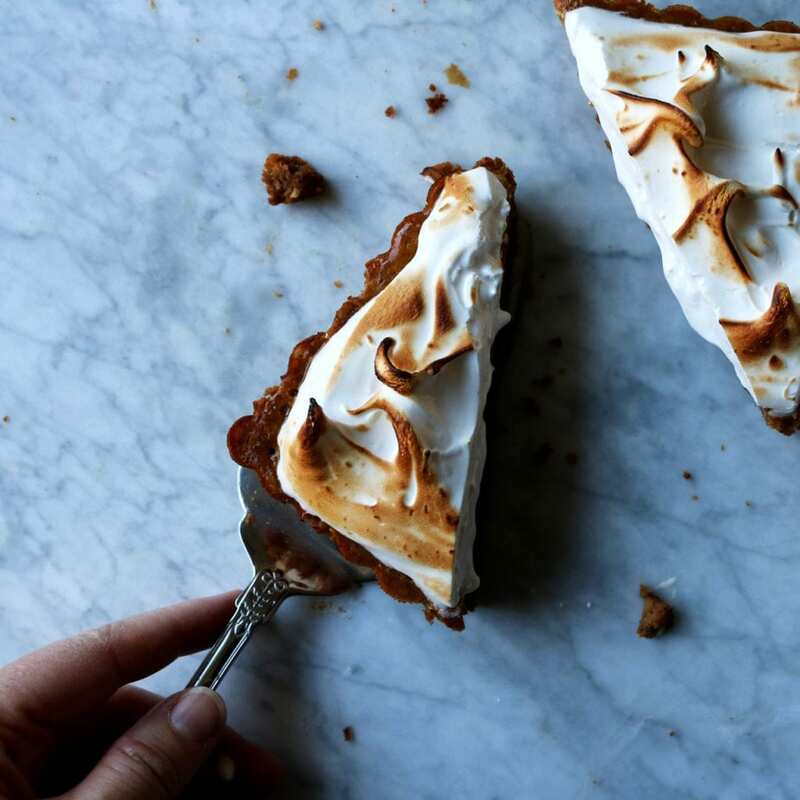 Take the chai pumpkin tart out of the oven and let it cool completely on the counter. At this point you could wrap it tightly in plastic wrap and set in the fridge for 1-2 days. For the meringue, add four egg whites + sugar to the bowl of your electric stand mixer fitted with the whisk attachment. Whisk on medium-high until shiny and starting to hold tracks in the meringue as the whisk goes around the bowl, about 5 minutes. Add the vinegar and vanilla and mix for another couple of minutes. If you take the whisk out of the mixer, flip it upright and the meringue holds it’s shape, you’re done. If not, put the whisk back and continue whisking for another couple of minutes. 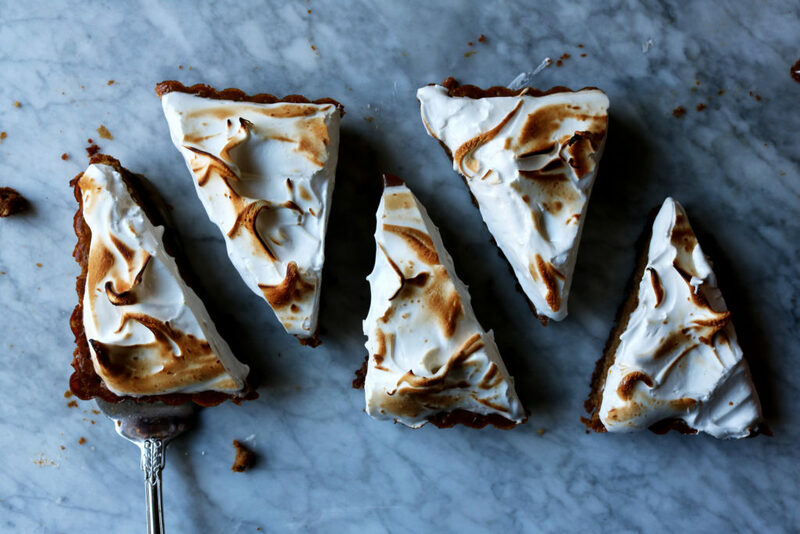 Once the meringue is holding stiff peaks, spoon it over the top of the chai pumpkin tart. I like to leave a little bit of an edge around the tart so that the rich pumpkin color shows around the edges. Once it’s all piled high on there, use the back of your spoon to gently even it out a bit and lift the spoon up every inch or so to create little peaks. Grab a torch and move it in a circular motion all over the top of the meringue until bronzed or you can position a rack to the top third of the oven, turn on your broiler, set the baking sheet with the chai pumpkin tart on the top rack and broil for about 30-40 seconds, moving the baking sheet around to get it to brown evenly. I’m going to try to get up one more Thanksgiving dessert recipe, plus a stuffing + potatoes gratin recipe up on the blog. Cross your fingers!! Wish me luck — I’m already feeling like I’m on vacation! 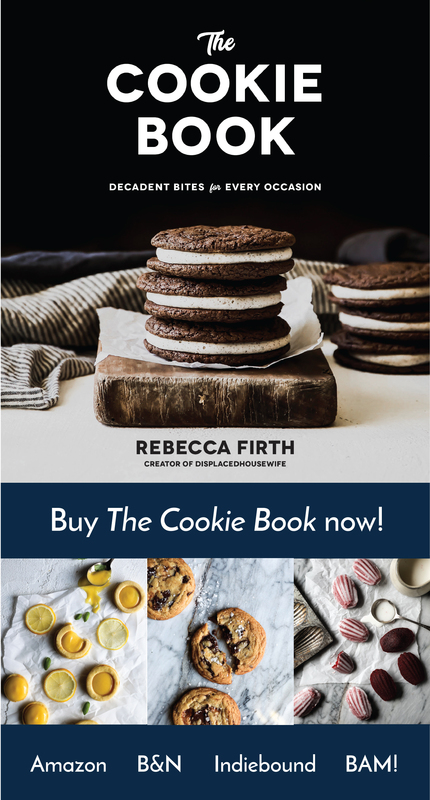 I have a gift guide come up…I’m so exciting with it and it’s all food related. Yay! If you start to feel angsty about the current state of affairs, watch the first five minutes of Love Actually on repeat. It never gets old. Never fails to make me cry. Never fails to make me feel better about the world. Tell me some of your Thanksgiving traditions below…I always like to add something new. What should it be this year? I haven’t narrowed down the signature cocktail yet…any ideas? Recipes? 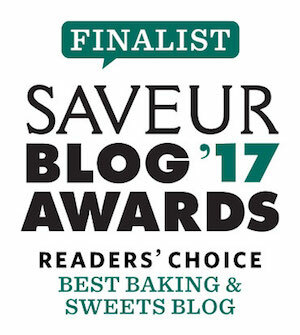 Please put links + recipes below!! We’re on Thanksgiving countdown…here are some of my favorites: Cranberry Spice Breakfast Buns, Cranberry Scones, Salted Caramel Pumpkin Cheesecake, Five Spice Cranberries (three ways), Apple Spice Cake, Boozy Sugared Cranberry Cheesecake, Pomegranate Rosemary Cocktail, Easy Labneh Appetizer, Persimmon Salsa, Port Cranberry + Apple Petite Rosette Tarts, Pomegranate Burrata Salad, Fresh Fig + Toasted Pecan Salad, Bacon Brussels Sprout Slaw, Baked Cranberry Apples and Five Spice Cherry Pie. If I don’t get another post out or our paths don’t cross, I wish all of you the best Thanksgiving ever. I hope it’s filled with lots of love, good cheer and peace. Planning to make this today (one year late!). Would be helpful to know the volume of gingersnaps since the cookies themselves come in many sizes. 10-13 seems too few for 1/4 cup butter–unless we aiming for a thin and crispy layer? A refreshing update to holiday flavors. This is such a fun recipe to try! I love the fluffy meringue on the top! and love your thanksgiving tips :) Have a lovely Thanksgiving dear Rebecca! I just got a torch and haven’t used it yet. Thanks for coming through with a recipe I can test it out with. Love your Thanksgiving tips too. Have a great week Rebecca! Now, it’s my turn to swoon Rebecca!! I love, love, love this tart! 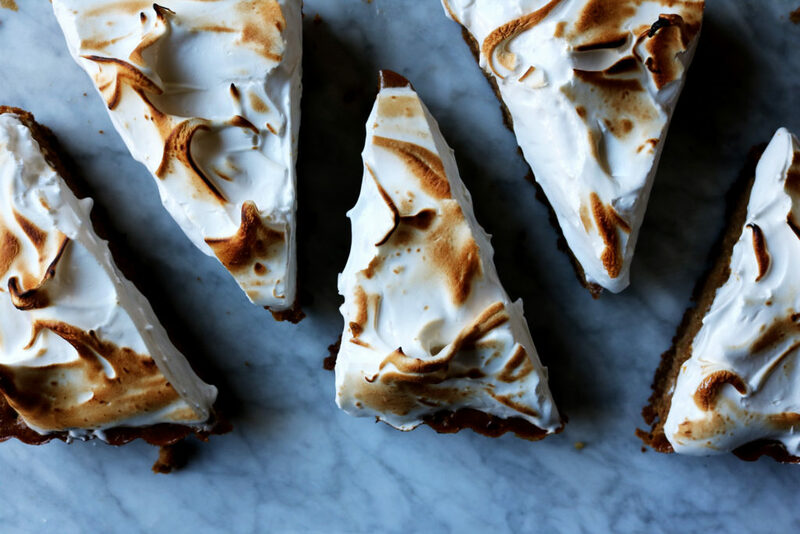 That gingersnap crust…my fave. The warm chai spices in that yummy filling. OMGEEE! And of course that meringue topping so I can break out the torch!! Total winner! !